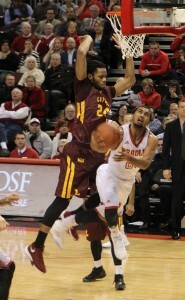 Freshman guard Dwayne Lautier-Ogunleye tries a reverse layup during a game against Loyola-Chicago. Lautier-Ogunleye led all Braves with 18 points. Photo by Ann Schnabel. The men’s basketball team could have swept its season series with Loyola-Chicago on Wednesday. The men also could have won consecutive games for the first time this season. However, the Braves’ cold shooting prevented them from doing either. Bradley lost 54-43 to the Ramblers in a game where both teams shot poorly; the Braves shot an abysmal 29.3 percent from the field, 15 percent from three, and were only 6-16 from the free throw line. Head coach Brian Wardle said he thinks the struggles have to do with the lineup combinations he is currently using. “I need to do a better job of finding the right combination and trying to find some way to get us in a rhythm offensively,” Wardle said. The Braves stumbled early on, missing 12 of their first 13 shots, and found themselves down 12-4 halfway through the first half and trailed 25-18 at halftime. The 18-point output was their lowest scoring total in a half since Dec. 30 at Northern Iowa. The shooting woes followed the Braves into the second half, and the team struggled offensively until the last three minutes of game when it found a late offensive surge. Bradley was able to cut its 13-point deficit down to five after a few quick buckets from freshmen Dwayne Lautier-Ogunleye and Antoine Pittman. However, the Braves were never able to fully recover from the deficit. Despite the offensive struggles, Wardle said he liked the effort his team gave on the defensive side of the ball. Lautier-Ogunleye was the leading scorer for Bradley with 18 points, seven rebounds and three assists. Sophomore Donte Thomas added another six points and 13 rebounds. Lautier-Ogunleye said the team knew what its identity was. One positive Bradley can take away from this game is their efforts on the boards; the Braves won the rebound battle 47-37. Wardle said the Braves will continue to work on consistency on both sides of the ball, and Lautier-Ogunleye says he thinks the team is close to achieving that consistency.